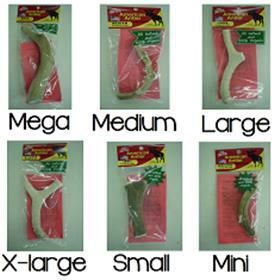 Dogs 40 to 60 pounds are recommended for the Large sized American Antler Dog Chew. Approximently 7 inches. Antlers are unique and the size will vary. The stock picture is not the actual antler you will get. Dogs 20 to 40 pounds are recommended for the Medium sized American Antler Dog Chew. Approximently 5.5 inches. Antlers are unique and the size will vary. The stock picture is not the actual antler you will get. Dogs 80 pounds and bigger are recommended for the Mega sized American Antler Dog Chew. Approximently 11.5 inches. Antlers are unique and the size will vary. The stock picture is not the actual antler you will get. Dogs under 10 pounds are recommended for the Miniature sized American Antler Dog Chew. Approximently 3 inches. Antlers are unique and the size will vary. The stock picture is not the actual antler you will get. Dogs 10 to 20 pounds are recommended for the Small sized American Antler Dog Chew. Approximently 4.5 inches. Antlers are unique and the size will vary. The stock picture is not the actual antler you will get. Dogs 60 to 80 pounds are recommended for the Extra Large sized American Antler Dog Chew. Approximently 9 inches. Antlers are unique and the size will vary. The stock picture is not the actual antler you will get.